What is the approximate square footage of your home? How old is your home (in years)? If you’re living in an average to large home, in the Houston area, built more than 20 years ago, you may have seen an increase in your electric bill of a hundred dollars or more during the summer months. If you’re considering an older home to purchase, energy costs should be a factor in your decision. Increase the value of your home – each dollar spent on Tune-uP-recommended improvements will increase the future sales value by more than a dollar. 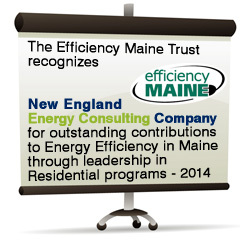 Maine Home Energy Audits is proud to offer its clients the most thorough energy audit available. If you are interested in improving your home’s energy performance, an energy audit is for you. A comprehensive energy audit can increase your home’s energy efficiency, reduce utility bills, improve indoor air quality, and create a more comfortable and healthier home for your family. You will also be helping to protect the environment through energy conservation. Instead of guessing the causes of your home’s energy efficiency problems, our Building Performance Institute certified auditors use diagnostic equipment to test your home. Rather than focusing on a single component, such as single-pane windows or an old air conditioning system, diagnostic tools (blower door, ductwork blaster, and infrared thermal imaging camera) are used to undertake a ‘whole house approach’ to create recommendations for heating and cooling equipment, insulation, air infiltration, windows, doors, and lighting. See below for more in-depth information on these diagnostic tools.